The 2017 Ladies Classic is all over and by all accounts it was another most happy and enjoyable event. A chilly, overcast Sunday was greeted by two glorious days on Monday & Tuesday. 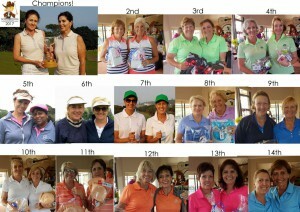 The Ladies Classic was a blast! And finally we had good weather to give to them after all the previous damp years! Well done to all the players, especially overall Winners, Queenie Steyn & Maritha de Beer from Pretoria – who won by one shot from Southbroom Lady Captain, Michelle Davies & Candida Amm – Our Lady President! DJ giving some quick tips before the Ladies tee it up on Sunday Morning! Thanks to Legends Players – Des Erasmus, Mel Davies, Jurgen and Josh Pretorius for sharing your talents starting the party so well! 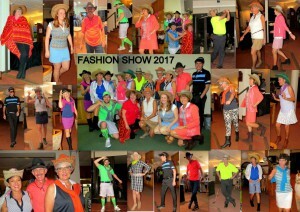 The fashion show was as colourful & stylish as always! One of the features of the Ladies Classic is how beautifully the ladies dress throughout the tournament and this year was no exception. 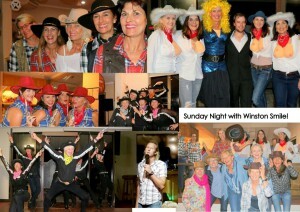 The Theme this year was Country & Western and what a successful theme. It was thoroughly embraced by all, with the Westlake Ladies even driving all the way up from the Cape in their 2017 Mustang which they arrived in great style for the party on Sunday evening! Everyone’s outfits were brilliant throughout the entire tournament! It was great to see all the effort shown by the Ladies! The Southbroom Line Dancers were brilliant, The Fashion show enjoyed the biggest line up of top models ever and the imported act of Dolly Parton and Kenny Rogers singing their duet of Islands in the Stream brought the house down! On Sunday Winston Smile had everyone up and dancing! 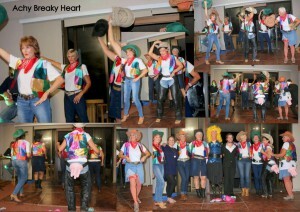 Our top Lady Line Dancer’s! Thanks to so many special members who all put in a whole lot of effort and helped with the costumes, props and décor for the evening. Gavin’s staff of Adri, Thembi, Sarah, Pete and all the bar staff put on a great show of delicious food and great service altogether creating a superb evening. Sunday morning was overcast, a little windy but never rained, phew! The golf course was in immaculate condition, the weather did threaten, but luckily held off for the day. The scoring at the top set the trend for a very competitive tournament that kept many teams in play right to the final day. Leading after Day 1 was Luz Da Silva & Pam Naidoo who counted out Queenie Steyn & Maritha De Beer on 47 points, with Defending Champions, Tessa Hinton & Jo Morley- Jepson a close 1 point behind. Monday was cool, but sunny! With the sun out, we thought the scoring may get even better, it didn’t but it remained as tight as ever with a new set of daily winners. 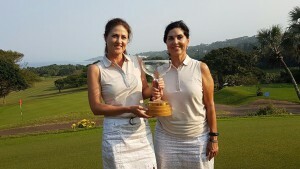 Melanie Kempe & Rose Bishop had 46 points, beating off Paula Jardim & Enid Schonknecht, Lilian Boyle & Clare Pantcheff, and Liezel Van Achterbergh & Irma Visser all 1 back with 45 points. Tuesday was a gorgeous morning with a shotgun start at 8am and the ladies were quickly into the swing of things. Scoring again we very close with Morag Magnussen & Michelle Grundy (46 points) fending off Sunday Van Der Riet & Wendy Huddy, Gwen James & Heather Clarke, Marian Ledingham & Val Mackenzie and Michelle Davies & Candida Amm all 1 back with 45 ponts. This all resulted in a very close finish, Michelle Davies and Candida Amm had shot their best score for the tournament to finish second, 1 point behind eventual winners, Queenie Steyn & Maritha De Beer! A big thank you must also go out to all our sponsors and especially those who manned their tees and spoilt the players! Thanks to active tee sponsors Realty 1 Southbroom, Coral Tree Colony, South Coast Refrigeration & Lynne Blackstock! Well Done again to the hard working Ladies Committee and special thanks to Deanne Purtell (Dance Show Choreographer), Mari Fielden & Sandy Luus for all the wonderful décor, enthusiasm and transforming the club house magically. 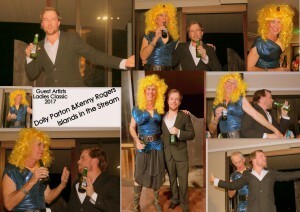 Thanks to our handsome starters Mel Davies & Bob Thomas. Course Marshals – Gerald & Vic! And efficient Registration Ladies Angela & Nicola. Click here to be placed on the 2018 invitation list.